If you’re using Azure Active Directory Domain Services and want to configure Active Directory Integration (ADI) to access this source to sync your users and groups to your KnowBe4 console, follow the instructions below. You must have an Azure Active Directory with Azure AD Domain Services enabled. You must also have enabled Azure Active Directory LDAPS. Follow the instructions on our ADI Installation article to install ADI on the selected internal machine. When prompted for the "Active Directory Hostname or IP address" during installation, use the Domain Services Internal IP ("IP Address on Virtual Network" from your Azure Properties as shown in the below image). When prompted to "Enable SSL", type true. Follow the instructions on our ADI Installation article to install ADI on the selected external machine. 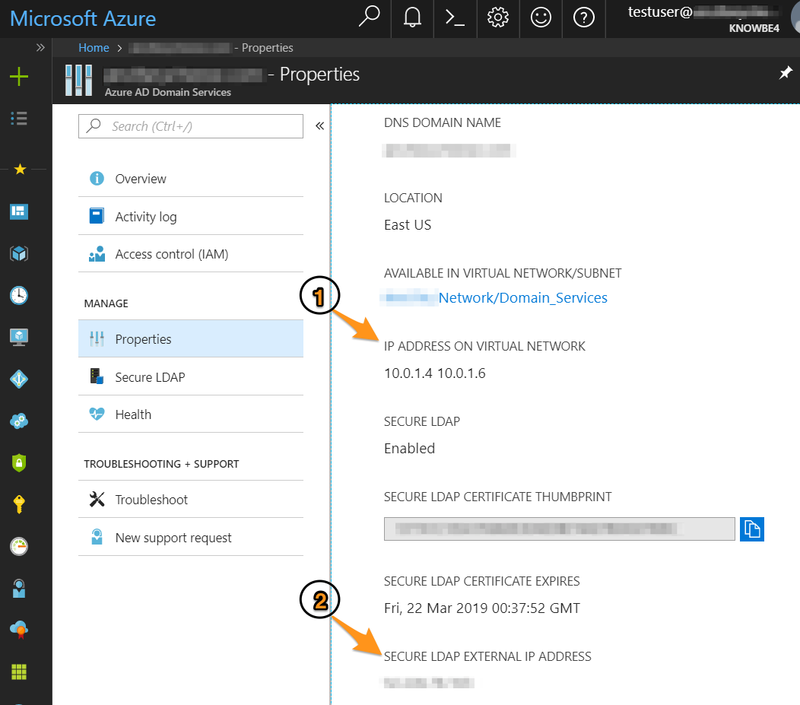 When prompted for the "Active Directory Hostname or IP address" during installation, use the LDAPS External IP ("Secure LDAP External IP Address" from your Azure Properties as shown in the below image).